Kate Dallenbach had received a piece of racing advice from her mom, former driver Robin McCall Dallenbach, that she’d taken to heart. Mom’s point was that to earn respect, every race driver has to establish a willingness to crash rather than back down. The only problem was that on this particular night a couple of years ago at Florida’s New Smyrna Speedway, Kate was racing her brother, Jake. The siblings wound up parked in front of where their parents were standing. Embarrassed and nervous. With not one but two parents who were successful race drivers, a grandfather who’s practically an icon of Indy car racing and older brothers who are drawn to speed, Kate Dallenbach wasn’t going to end up chasing an office job. 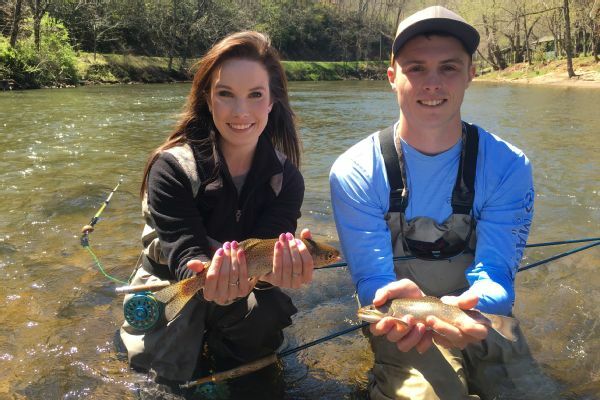 It’s only fitting that Bass Pro Shops is a partial sponsor for outdoors lover Kate Dallenbach, here with friend Chris Mitchell showing off their fly fishing catches in Asheville, North Carolina. Six months shy of her 20th birthday, she has been driving various types of race cars for almost a dozen years. And that miscue at New Smyrna notwithstanding, she is starting to impress. She is coming off her first head-turning accomplishment: a late model victory last month at historic and tough Hickory Motor Speedway in North Carolina. She’ll race again Friday night at Southern National Motorsports Park near Kenly, North Carolina. That isn’t exactly how the song goes, but winning at Hickory — the 65-year-old track bills itself the “birthplace of the NASCAR stars” because of its storied place in stock car racing history — keeps Dallenbach pointed toward her goal of reaching the Sprint Cup series in a few years. She has a couple of key relationships in place: partial sponsorship from Bass Pro Shops’ SHE Outdoors apparel — a natural fit because of her family’s love of hunting and fishing — and support from prominent NASCAR team owner Richard Childress, who signed her to a developmental driver contract last year. “Hopefully, I can finish up the late models this year and, next year, start testing and moving into the [Camping World] Truck Series,” Dallenbach said. Name recognition won’t be a problem. Wally Dallenbach Jr. is a two-time Trans-Am champion and four-time class winner of the 24 Hours of Daytona who drove for Hendrick Motorsports and other prominent teams in NASCAR. He has worked for NBC, TNT and Fox Sports as a race commentator and analyst. Robin Dallenbach made two starts in NASCAR’s top division in 1982, when she became the youngest woman to qualify for a Cup race at age 18, and raced other types of cars. Wally Sr. won five Indy car races between 1965 and ’79, nearly won the 1975 Indy 500, and was Championship Auto Racing Teams’ chief steward from 1981 to 2004.